V.F. Corporation, together with its subsidiaries, engages in the design, manufacture, and sourcing of branded apparel and related products for men, women, and children in the United States. It owns a portfolio of brands in the jeanswear, outerwear, packs, footwear, sportswear, and occupational apparel categories. The company is also a member of the S&P Dividend Aristocrats index. V.F. Corporation has consistently increased dividends for 36 consecutive years. The company last announced a dividend raise in October 2008. Over the past decade this dividend growth stock has delivered an average total return of 5.70% annually. The stock price decreased from its all time highs of $96.20 in 2007 to a multi-year low of $38.22 in 2008, before strongly recovering from its lows. The company has managed to deliver a 6.80% average annual increase in its EPS between 1999 and 2008. V.F. Corporation is expected to earn $4.90 share in FY 2009, followed by $5.50/share in FY 2010. The company is currently experiencing some short term in demand, which has led to a drop in revenues. If this recession proves to be a short one, the company would certainly manage to hit its annual goals of 8% annual revenue growth. The company’s foreign operations do have the ability to generate strong revenue growth over time. Another part of V.F. Corp’s growth strategy entails buying brands that could utilize the company’s extensive distribution network and result in economies of scale to produce the new apparel brands at a lower cost. 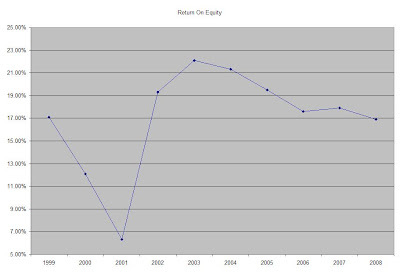 The Return on Equity has generally remained stable around 17% with the exception of 2000 and 2001. Rather than focus on absolute values for this indicator, I generally want to see at least a stable return on equity over time. Annual dividends have increased by an average of 11.90% annually since 1999, which is higher than the growth in EPS. Much of the increase came from V.F. Corporation’s 90% dividend increase in 2006. If we take this big increase out of the dividend growth calculation, we would see that the company typically raises distributions by an average of 3% to 5% annually. A 12 % growth in dividends translates into the dividend payment doubling every six years, whereas at a 4% growth rate it could take 18 years for the dividend payment to double. If we look at historical data, going as far back as 1986, V.F. Corporation has actually managed to double its dividend payment every eight years on average. The trends in the dividend payout ratio have closely tracked short term EPS weakness in 2000 and 2001 by rising to disproportionate levels. It also fell to 24% before the company decided to drastically raise distributions by 90% in 2006. The ratio has largely remained under 50% over the past decade, which is a good sign. A lower payout is always a plus, since it leaves room for consistent dividend growth minimizing the impact of short-term fluctuations in earnings. Currently V.F. Corporation is attractively valued, trading at 14 times earnings, yields 3.50% and has an adequately covered dividend payment. I would be looking forward to initiating a small position in V.F. Corporation (VFC) on dips.